for John P White, The Pyghtle Works, Bedford, 1901. Lavishly illustrated with all the important pieces he designed for them; mainly b&w but also some exquisite colour illustrations. A truly beautiful and stunning catalogue. John P White had a showroom in Bond St, London and also retailed through Liberty & Co at the time. 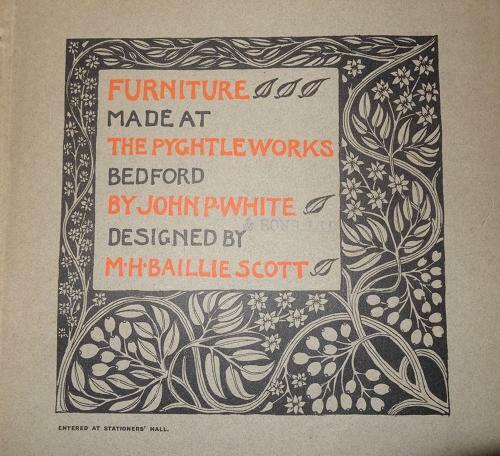 Baillie Scott designed furniture for John P White since 1898. By 1901 he had created approximately 100 designs which were available through the firm and illustrated in this catalogue. Baillie Scott was both a good close friend and business associate of White; hence the Scotts move to Bedford in 1901. Wear to covers but overall in good condition. as well as the JP White Fireplaces catalogue.